North Korean leader Kim Jong-un said Tuesday he is firmly committed to denuclearization and ready to meet with US President Donald Trump at any time, but warned he could seek an alternative course if the US misjudges his patience and sticks to sanctions. 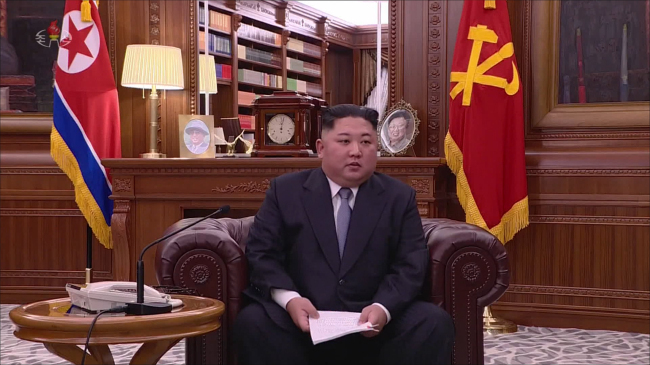 Kim made the remarks during his New Year's speech broadcast by the country's state television, also urging the US to take corresponding measures in exchange for denuclearization steps the communist nation has taken so far. Kim also said he is willing to reopen the now shuttered inter-Korean industrial park in the North's border city of Kaesong and resume a suspended tour program to Mount Kumgang on the North's east coast "without any preconditions." That could suggest Kim wants the resumption of the two projects as sanctions relief from the US. "I am always ready to sit down again with the US president at any time and will make efforts to produce an outcome that the international community would welcome," Kim said. "(But) we could be left with no choice but to seek a new way if the US does not make good on its promises, misjudges our patience, while seeking to force things unilaterally and clinging to sanctions and pressure," he said. Kim emphasized that it is his firm intention to work on building "new relations" with the US, establishing lasting peace on the Korean Peninsula and seeking "complete denuclearization," as agreed to in his June summit with Trump, if the US takes trustworthy and corresponding measures. "If the US responds to our active and preemptive efforts with trustworthy steps and corresponding behavior, (the North-US relations) will move forward at an excellent and fast pace in the process of taking concrete and innovative measures," he said, apparently referring to the measures Pyongyang has taken since the June summit, including dismantling a nuclear and missile testing site.